A very special girl came to live with me this week. 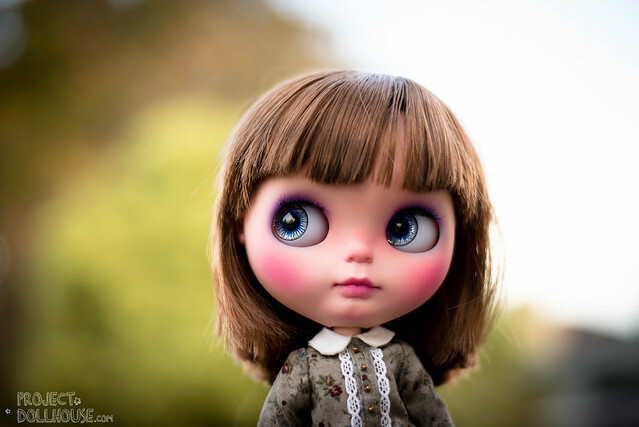 That note pretty much was a complete summary of my time chatting to Freddy Tan and creating my first commissioned Blythe. 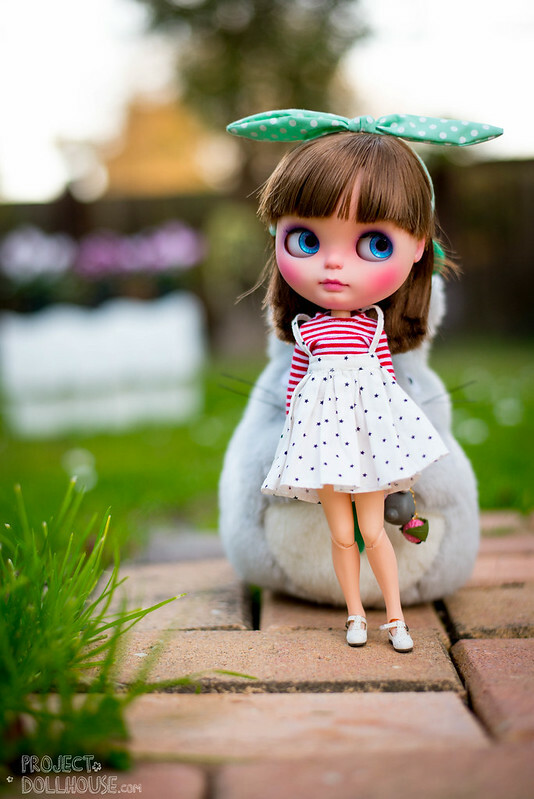 I’ve written previously about the little Totoro Girl Freddy was creating for me, and she finally made it home! Freddy has been wonderful, and generous to a fault. He was completely understanding of my scatterbrained indecision and created a girl for me that is – believe it or not – even more stunning in person. In his little note he was thanking me, for I know not what, because he had created this little work of art, but – it does go to show what his personality is like. When I opened the package I let out a little gasp at how lovely she was. Love at first site, so they say. She was different, beautiful, and distinctly mine. It’s been a busy week. I had my third exhibition opening for this year, and have been horribly sleep deprived. 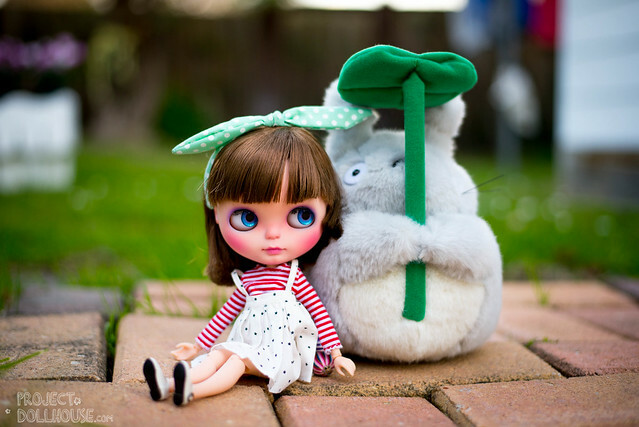 Totoro-Girl arrived earlier in the week, and she had been sitting on my shelf guilting me at her lack of being played with. I rushed home today manically to catch the last hour of sunlight (winter! No!) to try to capture a bit of her character. She is beautifully made. Her little button nose. 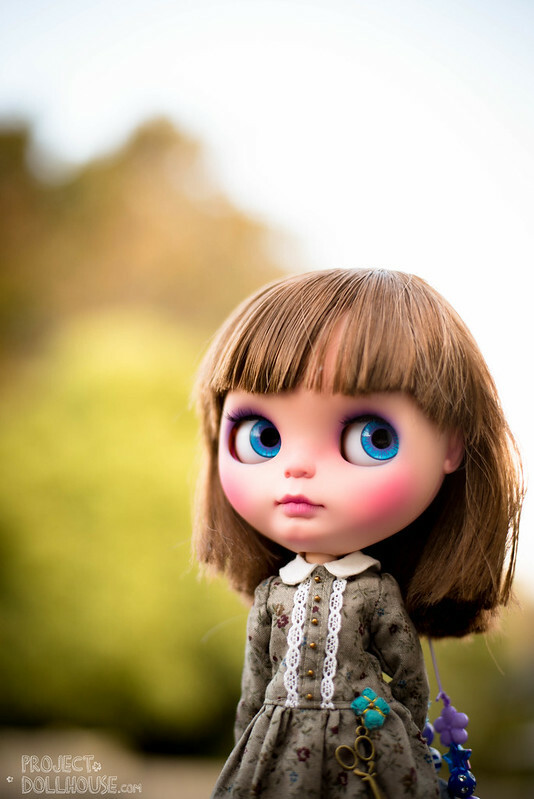 Her rosy, rosy cheeks, her unbelievably detailed lip carvings and tiny, tiny painted lip lines. I mean seriously, I own a few custom dolls and the detail here is exquisite. 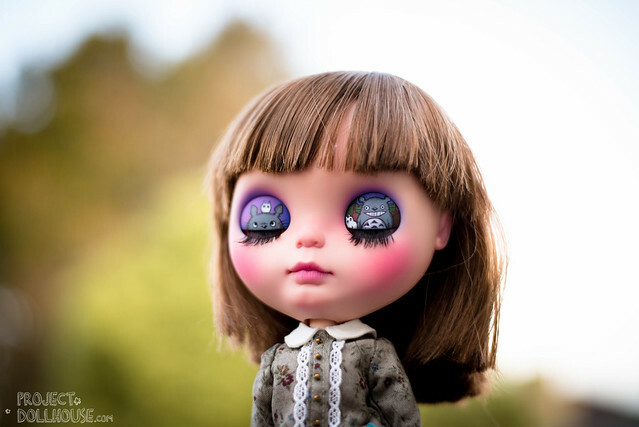 I’ve mentioned before about how much I love the eyelid art, but it completely blew me away when I saw it in person. Fine, airbrushed backgrounds, and supremely detailed little cartoons of a grinning Totoro and his pals. Having naps with a squishy friend. I asked Freddy to give her a little bob haircut and I think it suits her quite well! 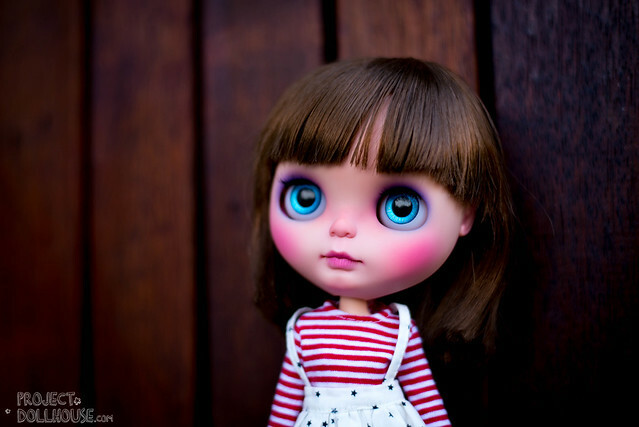 He also gave her 4 custom eyechips (3 hand-painted and 1 realistic) to match her new look, and I was amazed at how they caught the light (or what little light there was outside). She has such a sweet, cheeky character. 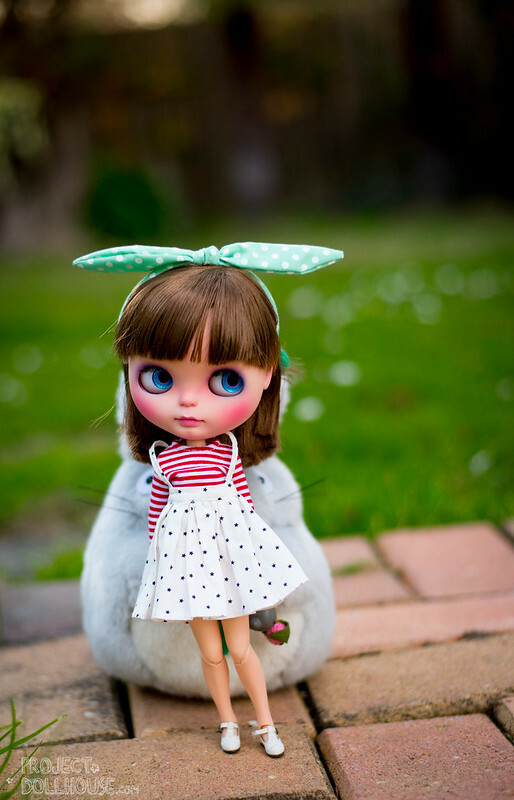 Right now she is sitting on my shelf looking longingly at Alice Du Jardin’s crazyily detailed outfit. I think she might want a new dress soon! At least that’s what I think she’s thinking. I asked Freddy to give her a Pure Neemo body for posability, and boy, is the Pure Neemo flexible! He also gave her movable wrists which blew my mind a bit, it never occured to me. However, without rigid legs, she does have a slight drunken tendency when she stands 😀 I’ve never had a Pure Neemo on a Blythe before (that was another of my crazy moments) but I figured I could bend her around a bit. I just didn’t take into account her giant head. Non-chalantly leaning for dear life, but I can make it look natural! That being said though, it’s so much fun being able to pose the girl any way you like! So many options! Freddy also signs the back plates with such detail! It’s a gorgeous little illustration with Totoro’s ^^^ belly arrows sitting on a love heart. It was such a lovely thing to include with the doll. This whole process with getting my own commissioned doll has been quite a wonderful experience.It was almost like creating something special with Freddy, as he would take me through every step. I am forever grateful – as someone who’s job works in a very similar manner, Freddy made it super easy for me. I felt so pressured to give her a cute name as well… most of my girls have all come pre-named, or I force my husband to name them. He claimed this one was too much pressure. I ended up calling her “Noriko” or “Nori” for short (yes, like the seaweed, I seem to like giving my girls food names). 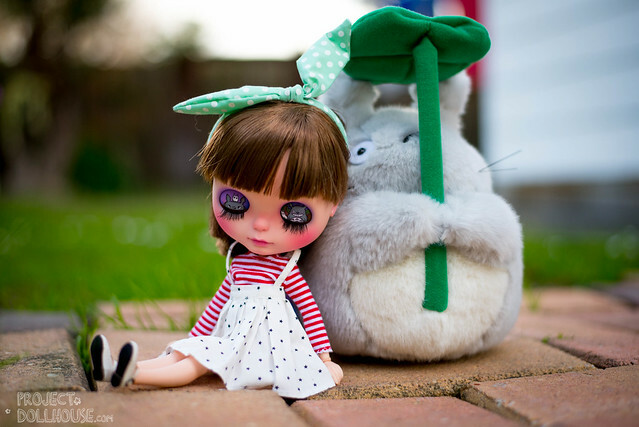 So, welcoming Nori to my ever-growing Dolly Family! You’ll be seeing a lot of her! I think I definitely need to get her a set of hands! I also need to work out the magic to make her stand more rigidly, she’s got the exact opposite problem to Blythe, her knees are super-bendy! 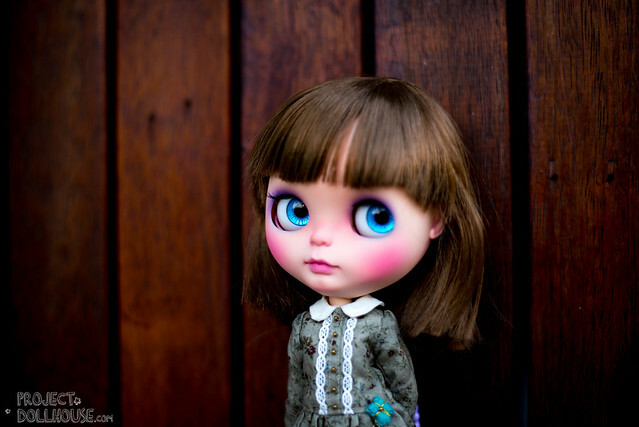 This must be one of the prettiest Blythes I’ve ever seen in my life! 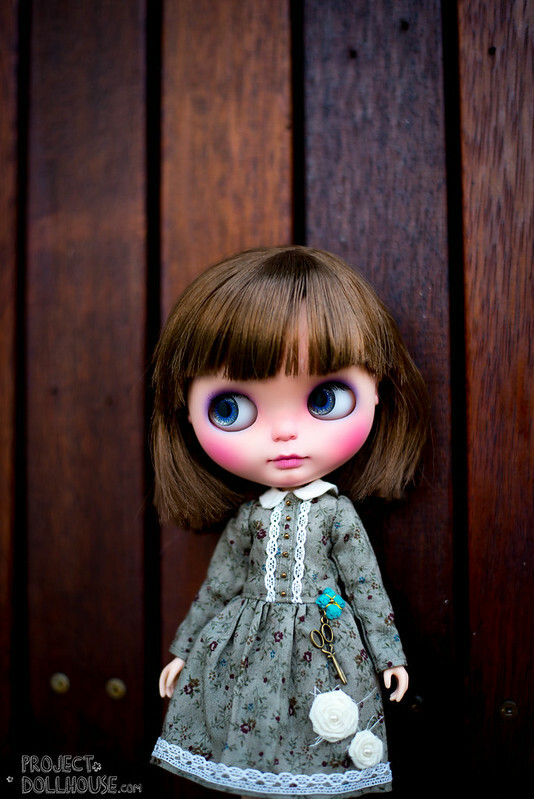 I was so curious about her that I checked out Freddy Tan’s Flickr and I’ve fallen in love with a gorgeous Strawberry Shortcake Blythe. 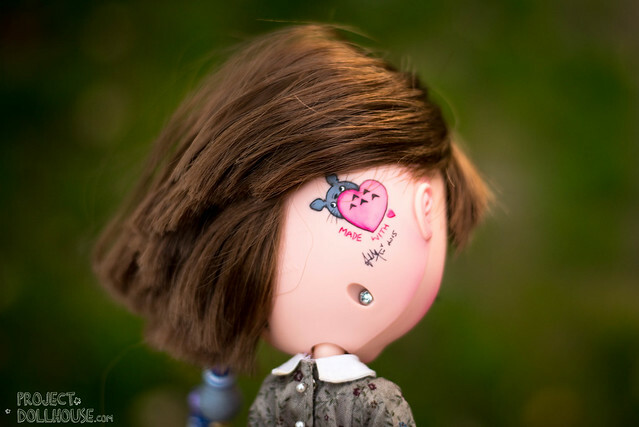 Do you mind if I ask you how do you contact Freddy to inquire about the prices of his customized dolls? Does he have a blog or a site I can message him? Thank you! You can contact Freddy through facebook – you can find him on Dolly Adoption or many of the other dolly sites. If you can’t get a hold of him – tell me and I’ll try getting another avenue for you. He’s super talented and is one of the nicest people I’ve ever met in the Dolly world!